Immerse yourself in entertainment with the full-featured DP100MW8 Progressive Scan DVD player from Magnavox. Great for the kids room, bedroom, office, or kitchen area. 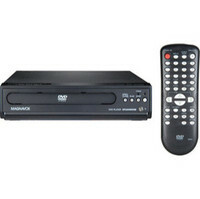 It delivers the convenience of multi-format (DVD, DVD-R/RW & CD-R/RW) playback, as well as an S-video connection for better looking movies. Also includes slow motion, frame advance and quick set up. I bought this DVD for less than 15 dollars based on a very favorable review of the sound quality. For the price paid I did not expect anything out of the ordinary. But I was pleasantly surprised to connect it to my Yamaha ns 1000 speakers and Sony TA 2000f preamp with the TA 2000 power. It's detailed and articulated sound, looking like the best recordings that each instrument had a separate channel and microphone for their recording. With powerful bass and a midrange sweet and sharp well defined, creating an atmosphere almost surreal, with physical presence of musicians. A real bargain for the price and sound quality.